Hyundai is promoting the Veloster Turbo in “Cheetah”, a television commercial which premieres on screens during the 2012 Super Bowl. 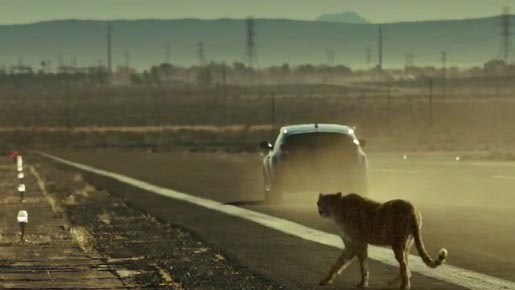 “Cheetah,” a 30-second spot slated for the first quarter, features a caged cheetah set to race a new 201-horsepower Veloster Turbo on a long stretch of open road. The car launches and the cage opens, but just a few yards into the race, the cat realizes he’s met his match as the car speeds ahead. The competitive cheetah then takes his frustration out on his handler. “Trust us, it’s fast. And with a 7-inch multimedia touchscreen, a 450-watt dimension® premium audio system, and Pandora® Internet radio, there’s a lot more the 201 horsepower Veloster Turbo can do, besides outrunning a cheetah”. The Cheetah ad was developed at Innocean by creative directors Robert Prins, Max Godsil and Eric Springer, and producer Jen Weinberg. Filming was shot by director Daniel Kleinman via Rattling Stick. Editor was Steve Gandolfi at Cut + Run.